Home? Anywhere, as long as it's with my family. Anywhere, except with my parents. On the hockey rink with my team. In my bedroom when it's raining, listening to the rain on the roof. I hear songs I haven't heard for decades, songs my parents played, and I'm back with them. Home? The smell of eggs frying in the morning. Snow, the first snow of the season. Being with friends, that's what feels like home to me – just hanging out. When do I feel at home? Alone – only when I'm alone. Coming home, for me, was falling in love. I walk into my office, and it's like a second family - often better than my family. I have got to have a wide open view. Nestled, with pine trees all around. A small house, small rooms. It’s a small white attic room. As a child, it was my last bedroom. Now I paint in it. But even more, home is the river I grew up beside. My back yard. Best time of all: late summer, early evening. I’ve loved this province all my life – that's been kind of a home to me – but I never had a true home of my own. I was kind of a nomad. I never saw myself – me, myself – having a real home. Now. at almost sixty, this is the first time in my life. It keeps changing. You know, you get married, you get divorced. Everything changes. And then changes again. Home, for me, is anywhere, anywhere in the world where I can feel good – which is just about anywhere. These are the central words of a piece I wrote while sitting with my father on the day of his death, after his death. It's the old dream of heaven (without clouds and wings and angel's things). Or maybe, even more, it's the equally old dream of heaven on earth. I think it was my father's deepest longing, to have a happy loving forever togetherness, a true home of the heart, but he didn't quite know how to make it real. At some point, if we’re lucky, we know we're at home. We choose to stay where' we were born – that's where we know we want to be. Or we move and settle elsewhere, sometimes in the same area, sometimes in a far-off part of the world – and find that's right for us. Sometimes we do the choosing. Sometimes we know when we've come to the right spot – it's as if our home space has been waiting for us. If we're very lucky, we feel at home in many places, any place we happen to find ourselves. And what feels right at one time may not at another. Some people never find what feels like home. To go to the word piece - in my own, my chosen home - click here. To go to the creativity blog, click here. 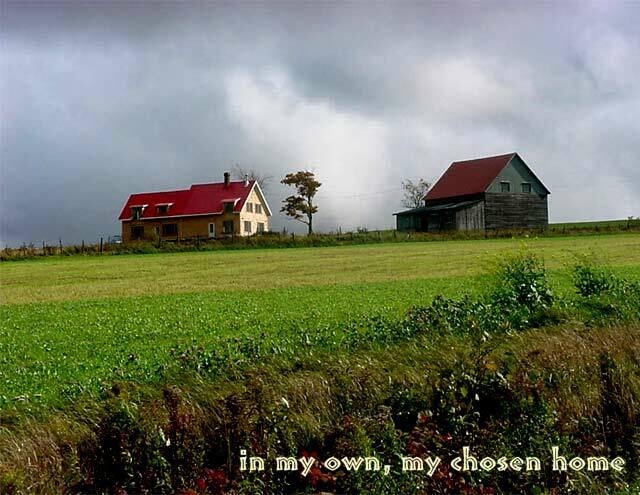 which is both a chosen home and a home I have built myself.